Michael Noonan says it’s here for the “foreseeable future”. 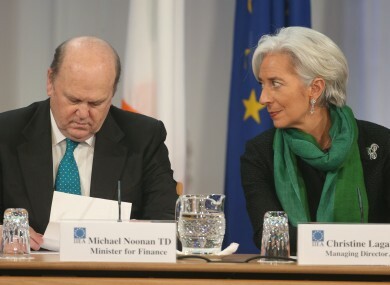 Finance Minister Michael Noonan and IMF Managing Director Christine Lagarde. THE UNIVERSAL SOCIAL Charge (USC) is going nowhere for the time being according to Finance Minister Michael Noonan. The minister, speaking to Pat Kenny on Newstalk this morning, said that the tax is here for the “foreseeable future”. The Government announced in last month’s budget that the USC tax bands are changing to reduce people’s tax burden but, in today’s interview, Noonan said the Government has no plans to abolish it completely. “It collects an enormous amount of money, over €4.5 billion. It’s going to be part of the personal taxation code,” he said. Noonan also said that he would like to see the Central Bank’s new mortgage lending rules relaxed to allow more people secure 80%-plus mortgages. Under the rules, banks can have no more than 15% of their loan book made up of mortgages over 80% of value, Noonan says he would like to see this increased. “I would like to see that 20-25% and I think there’s scope to do that,” he said. Noonan was also asked about possible coalitions after the next General Election, saying that his party’s “preferred Government will be Fine Gael and Labour”. “We don’t know where Fianna Fáil stand,” he said on a possible coalition between the two parties. Noonan also announced today that Ireland is to pay its first €9 billion tranche back to the International Monetary Fund next month. The early repayment will save us €750 million in interest, according to the minister, and will take place on two dates in December. Noonan said that he expects interest savings of €1.5 billion to be achieved from early repayment of the total €18 billion, though the actual savings will depend on the timing and markets. He added that it is “essential” that we improve debt sustainability in order to break the boom and bust cycle of the past. Email “The Universal Social Charge isn't going anywhere - Noonan”. Feedback on “The Universal Social Charge isn't going anywhere - Noonan”.